One of the biggest issues with Sneaky Pete in the early stages of this season is the lack of an emotional anchor for all the crime caper drama. Through the first three episodes the show has largely focused on establishing who Marius is, what he did wrong, and how he plans on blending in with the Bernhardt family in order to pay off an old debt. 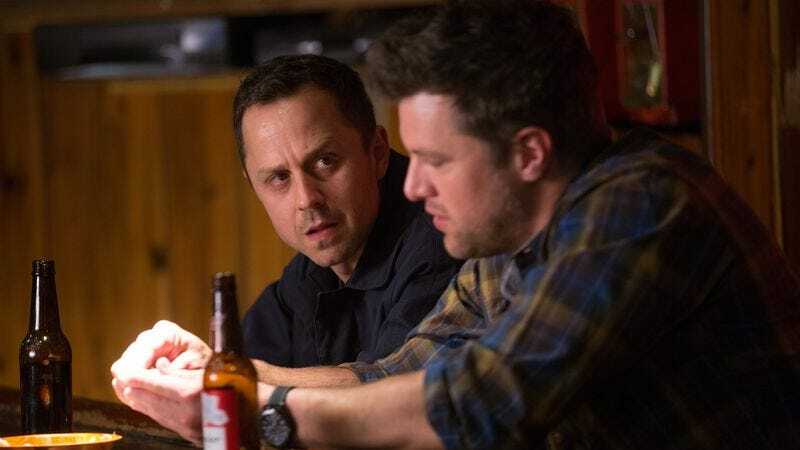 While the mixing of episodic and serial storytelling has made for some interesting narrative directions, it’s also led to the feeling that Sneaky Pete has too much on its plate. Particularly, the main conflict in Marius’ story is meant to be whether or not he’ll be able to secure the $100,000 to save not only himself, but also his brother Eddie. Through the first three episodes though there’s been no real exploration of the brotherly dynamic, and that’s hindered the emotional potential of Marius’ struggle. “The Fury” changes everything. It’s the first episode of the series that feels truly substantial, and more than that, like something unique. If the first three episodes of the series can be classified as mostly entertaining but also undeniably familiar and unchallenging, “The Fury” can be classified as the one that breaks the mold. Pointing to the final scene, which includes a lengthy, chilling, perfectly executed monologue from Bryan Cranston, is perhaps the most obvious way to suggest that this episode is different from the rest, but there’s much more than that. That final monologue is a beautiful thing, but it’s also the payoff to some nifty character work throughout the episode. What makes “The Fury” such an effective bit of drama is the way the show finally starts to complicate its characters in terms of their emotional state. Sneaky Pete shows that it’s barely scratched the surface when it comes to examining the inner turmoil of these people, and “The Fury” sets out to give us some insight into their insecurities, flaws, and strengths. The bulk of this insight goes to Taylor, who gets the most rewarding, devastating, and complicated single-episode arc so far this season. Up until now, Taylor has been presented as nothing but a man-child who just so happened to fall into a job as a cop. He’s the typical unhinged child who somehow found his way on to the force. What “The Fury” does though is flip the script a bit, showing us a side of Taylor we haven’t seen before. The emotional reckoning comes when Marius, desperate to get his driver’s license back form the trunk of Taylor’s car after the friendly kidnapping in the previous episode, invites Taylor for a beer in order to apologize for his behavior. This is all a ruse for Marius, but Taylor, with the aid of a few beers, opens up a bit, and we get a glimpse of his struggle. He tells Marius that he’s the one that should be apologizing, saying that he’s been told he has issues with impulse control. He believes that’s keeping him from getting promoted on the force, and in this moment Shane McRae really sells Taylor’s pain. Taylor may be a clown, but a lot of that is a coping mechanism, a way to hide his insecurity and his fear of failure. From there, “The Fury” does an even more intriguing thing: after finally building some sympathy for Taylor, the very next scene sees him lash out at a teenager in a parking lot before attacking him and beating the hell out of him. In that moment we see the darkness in Taylor, and we also get to see that despite his wrongdoing, there’s little chance he’ll be punished. This police force takes care of their own, giving a dangerous man like Taylor a terrifying amount of power and freedom. In the span of two scenes Sneaky Pete not only adds emotional layers to a supporting character, but it also manages to present a bit of commentary on the notion of community and privilege. Sneaky Pete is still hinting at more depth elsewhere, especially when it comes to Audrey. She’s hardly a focus in “The Fury,” and yet one single scene manages to deepen her story. Frantic and overwhelmed while driving, she makes a call to someone and we get just the slightest bit of the message she’s leaving. She says she can’t keep living like this, “robbing Peter to pay Paul,” and that’s all we get before the phone informs her that the inbox is full. Audrey screams in anger, as if she’s completely stuck with no way to get out. This type of teasing mystery is becoming Sneaky Pete‘s calling card, and while there’s always a risk when willfully withholding information—it can lead to the story feeling rather contrived—it’s working for the show so far. Then, we get to the final scene. After adding some depth to the characters throughout this episode, “The Fury” tops it off by finally wrenching some real emotions out of the relationship between Eddie and Marius. Early on in the episode, Katie tells Marius that he needs to run, that his time in Bridgeport is clearly at an end. Marius won’t leave though, not without the money to save his brother. That proclamation makes the final scene all the more horrific to watch, as Vince delivers a frightening story about sending a message to the people that do you wrong before ordering Richard to use bolt cutters to snip off one of Eddie’s toes. Eddie screams, and Marius can only listen on the other end of the phone. Finally, Sneaky Pete has established some real emotional stakes. “Tiptoe Through The Tulips” is one of the all-time great choices if you’re looking to punctuate your show’s violence with a strange, sweet, dark pop song. “Fine, Keri Russell, keep your secrets.” That line killed me. So where did Audrey go with the money from the cashbox? Apparently Taylor has himself in a bit of a mess with a married woman who was also maybe his girlfriend in high school. Carly is growing more and more suspicious of “Pete,” especially after she reads, in a letter from Maggie, that Pete was told about why they left the family. I am very curious to know what happened between Maggie and Audrey. That’s one of the show’s most intriguing mysteries to me. The whole Bernhardt family is one big question mark.